I thought this art had enough of a story going on to stand on it’s own. I actually made it a couple months ago but kept it to myself because I didn’t know if it was a little too far on the gory side for everyone. Anyway, I came across it again tonight and thought… eh screw it. Wow! it looks so so deep. Why are those fingers on the crown?? Looks like it might take me quite some musings to get the real meaning out of it. I have no idea why the fingers went on her crown. Are they her own from the stump or one of the peasants from the castle she burned, Idk! Uh thanks Colin… I think.. lmao! I second Cyranny’s thought. I saw it and immediately started trying to tell her story. Really cool art–weird and dark and gory! Just my cup of tea. lol I do like that quality 😛 Let’s see what I can do then! My life motto and key to happiness is “low expectations”. But now I’ll never know, since your expectations are so low 😛 thanks love, I’m almost finished! This has been a ton of fun. I’m sure you do, but you’re oh so fun to tease! Story’s up btw. I thought it was interesting that the subject has short hair on one side and long on the other, while one could attribute masculinity and femininity to their respective sides…there are also the link of those sides to the devil and angel on the shoulders. Where the masculine side relates to the devil and the feminine to the angel. My initial gut reaction to the missing hand was: the need to escape was so great that the subject cut off their hand to gain freedom from being shackled. Then in leaving the subject burns down their kingdom, the very thing that gave them power and kept them prisoner. 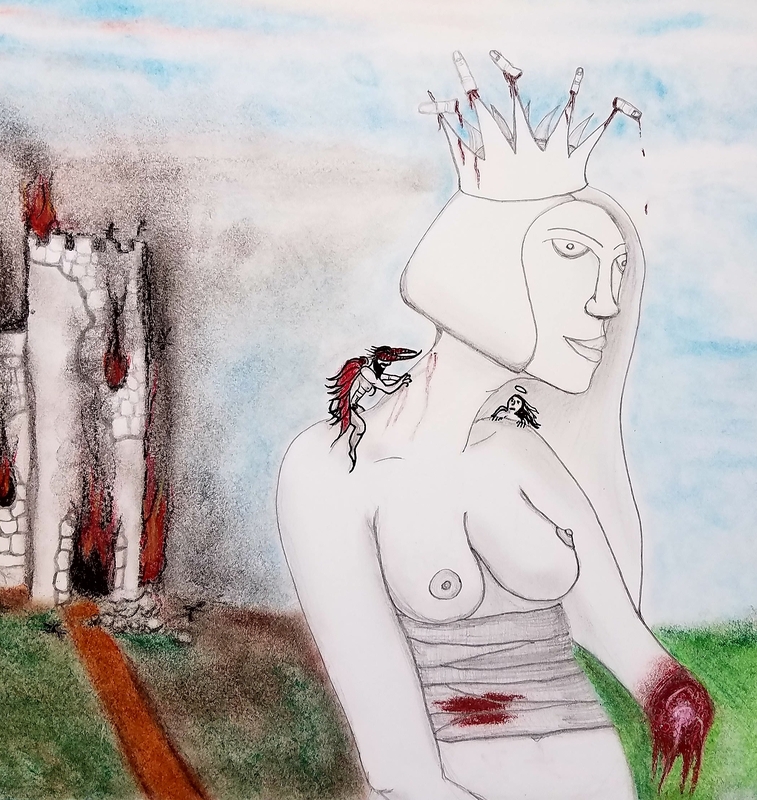 The fingers on the crown could be a show of power of the sacrifice: I gave up my own hand and kingdom to gain my freedom and as evidence of that I’ve impaled my fingers on the crown that now may be an empty symbol. Really thought intriguing and wonderful! Well done! Well hell, this is impressive! Thank you so much for sharing your insight. I agree about the fingers being a show of sacrifice. Very cool!